Is it Time to remove the Grime from your tile and stone floors in your home? We find that many home owners worry more about carpet and rugs cleanliness which we recommend cleaning every six months. 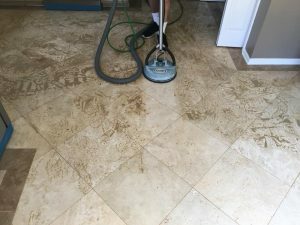 Ceramic tile or stone is one of the most abused and overlooked floor and wall surfaces in the home simply because of the care involved in cleaning it. No one is anxious to relive those terrible memories of scrubbing each tile and grout line for hours with a small brush and using those irritating, harsh, and unsafe chemicals. But your hard surface floor can accumulate a lot of dirt, cooking oils, and everything else you can throw at it over the years. The good news is TNT Chem-Dry of the Nashville area can make short work of this task, using only earth-safe products that won’t harm your family, your pets, or this world we share. If your tile requires sealing, we can refresh and restore the sealant for your tile to give you peace of mind your floor is in great shape and protected from future grime build up. TNT Chem-Dry is dedicated to helping you keep your home healthy, clean, and always looking its best. The solution to difficult tile and grout cleaning is just a phone call away. Call Tara to make an appointment for your Healthy Home Cleaning, 615-557-5231.